Spleen, trauma. Contrast-enhanced arterial-phase CT scan of the abdomen shows a mottled appearance of the spleen. This finding should not be mistaken for splenic injury. Confirmation of a normal spleen can be shown by repeat imaging in a later phase of contrast enhancement. The spleen then appears homogeneously enhanced. Many studies have been conducted to evaluate the imaging characteristics of splenic trauma with CT and to address the outcome of conservative treatment. Criteria for angiographic and surgical intervention based on these findings have been proposed in the literature and are discussed under CT SCAN. The spleen is a functionally complex organ occupying the left upper quadrant (LUQ). It is an intraperitoneal organ weighing 75-100 g in the adult. For the most part, the diagnosis of splenic rupture is not particularly challenging; however, radiologists should be aware of the possible processes that may simulate splenic injury. 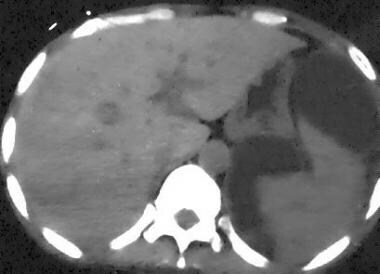 Occasionally, iatrogenically introduced material can demonstrate the appearance of splenic rupture on CT. In a typical trauma center, a nasogastric tube is placed, and contrast material is orally administered prior to CT examination. 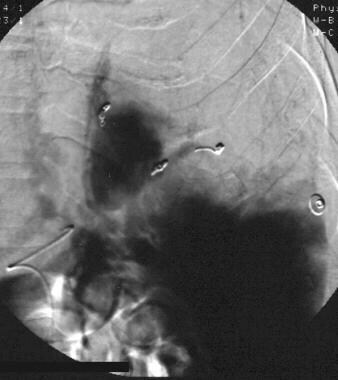 Streak artifact and beam-hardening artifact from the nasogastric tube and oral contrast medium, respectively, can overlay the spleen and cause confusion. Beam-hardening artifact from the ribs and streak artifact from gastric air-fluid levels can also produce false-positive results. A combination of these effects, together with poor-quality scans secondary to increased patient size, is fairly typical in everyday practice. To some degree, hemoperitoneum always accompanies splenic injury, with the exception of an intact subcapsular process. However, not all intra-abdominal fluid represents hematoma (see the image below). The radiologist must be wary of assuming that splenic injury is the cause if fluid is appreciated in the abdomen or around the spleen. Most blunt splenic trauma is seen in children struck by a motor vehicle, in those involved in an activity-related fall, or in occupants of motor vehicles involved in accidents. The greatest potential for false-positive results occurs in patients injured in motor vehicle accidents primarily because they tend to be older and have a higher rate of preexisting medical conditions. Spleen, trauma. Contrast-enhanced CT scan of the abdomen in the equilibrium phase shows perisplenic fluid with mass effect on the spleen. The spleen appears compressed by the fluid, reminiscent of subcapsular fluid collections. In this patient, the fluid was secondary to pancreatic pseudocysts mimicking subcapsular hematomas. Spleen, trauma. Contrast-enhanced CT scan of the abdomen shows a perisplenic fluid collection with internal increased attenuation. The splenic border is displaced by mass effect. This was a subacute subcapsular hematoma. This is a grade I injury. Liver, pancreatic, renal, and left-sided colon disease can lead to accumulation of fluid in the LUQ and inferior to the spleen. Other potential causes of fluid accumulation should not be forgotten; these include undiagnosed abdominal malignancy with ascites and peritoneal dialysis. Although many of these situations seem unlikely, the opportunity to obtain pertinent information from the patient may not exist. In most motor vehicle accidents, multiple individuals are injured. Elderly individuals tolerate even minor trauma poorly, and their hemodynamic status is commonly out of proportion to their apparent injuries. In addition, many trauma patients are combative upon their arrival to the hospital secondary to drug and alcohol use. The net result is that patients are transported to the radiology department after sedation or intubation. Spleen, trauma. Contrast-enhanced CT scan of the abdomen shows perisplenic fluid without identification of a laceration in a patient who sustained blunt abdominal trauma. A large amount of pelvic fluid was seen, prompting laparotomy during which a small laceration was found; this is not evident on the scan. Many processes can affect the spleen and simulate laceration or intrasplenic hematoma. A seemingly endless list of etiologies related to splenic cyst has been reported in the literature. Any one of these causes may be misdiagnosed as splenic injury, but these should not be accompanied by abdominal fluid or hemoperitoneum. Splenic abscesses caused by bacterial endocarditis, splenic infarction, and invasive procedures can simulate splenic injury, and they may be associated with perisplenic fluid. Spleen, trauma. Contrast-enhanced CT scan of the abdomen shows some perisplenic fluid in the anterior aspect. 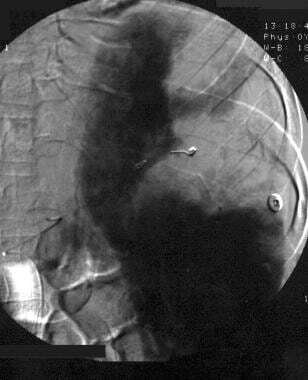 A small well-defined irregularity is noted in the splenic wall posteriorly. This was a congenital splenic cleft in a patient with perisplenic fluid secondary to nonsplenic injury. Infarcts of the spleen can simulate the appearance of trauma. Classically, infarcts are well defined and wedge or triangular shaped. Infarcts extend from the outer margin with the apex pointing toward the splenic hilum. A thin rim of normal parenchyma can sometimes be seen along the outer margin. Although infarcts do not enhance, the outer rim may show enhancement along with the remainder of the spleen because of preserved capsular vessels. On sonograms and nonenhanced CT scans, infarcts can be confused with a laceration without perisplenic fluid. Tumors of the spleen are uncommon overall. Most tumors of the spleen are related to lymphoma, which accounts for 70% of lesions. In addition, metastatic disease of the spleen is not uncommon, and melanoma, breast, lung, renal, and ovarian carcinomas are the leading primary cancers. These processes are hypoechoic on sonograms and hypoattenuating on CT scans, and they may simulate laceration or intraparenchymal blood. Metastatic disease can have associated ascites that simulates hemoperitoneum. Similar lesions in other organs and lymphadenopathy are usually present and exclude trauma. Lesion enhancement on contrast-enhanced CT scans is not demonstrated in blunt splenic trauma. The most common benign tumor of the spleen is the cavernous hemangioma. The tumor can be either hyperechoic or hypoechoic on sonograms and can simulate hematoma or noncoagulated blood, respectively. Hemangiomas appear hypoattenuating on CT scans, with variable contrast enhancement. Typically, the enhancement pattern is confined to the rim and fills in to become isoattenuating on delayed images. However, hemangiomas may not show contrast enhancement in a minority of patients. This finding is probably related to size of the lesion, with nonenhancement more commonly associated with smaller lesions. Benign lesions can simulate parenchymal hematoma or small lacerations if near the periphery. The clue to correct diagnosis is the smooth distinct borders and rounded configuration of the hemangioma versus traumatic injury. Snowflake-like calcifications or phleboliths are uncommon, but they can differentiate tumor from trauma. Diffuse splenic hemangiomatosis is a condition in which the spleen is enlarged and replaced almost completely by hemangiomas. The striking appearance of the spleen can be dismissed as severe traumatic injury at first glance. Nontraumatic splenic rupture is rare but has been associated with a number of disease processes. These entities may cause confusion, first because of their rarity and second because a traumatic etiology may be assumed. Careful inspection of the images usually leads to the correct diagnosis. Sarcoidosis is a disease of unknown etiology in which noncaseating granulomas form in tissues and organs of the body and have a predilection for the lymphatic system. The spleen is involved in 24-59% of patients with sarcoid but usually is asymptomatic. Those with marked involvement can develop abdominal symptoms. Severe cases can lead to hypersplenism and spontaneous rupture of uncertain etiology. Most commonly, the spleen is diffusely affected, and the findings can mimic those of lymphoma. 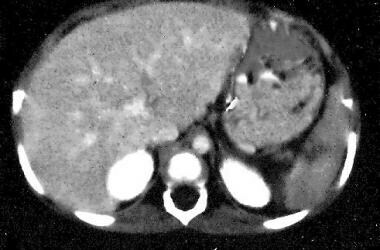 Splenomegaly is apparent in approximately one third of patients and frequently shows associated lymphadenopathy. Discrete hypoattenuating nodules are present on CT scans in approximately 15% of patients; these result from aggregated granulomas. The spleen is involved in amyloidosis, which is a disease in which plasma cells deposit amyloid, a complex protein made mostly of polypeptide chains, throughout the tissues and organs. Amyloidosis can be primary or secondary, related to chronic inflammation (most notably rheumatoid arthritis), and occurs in association with multiple myeloma. The spleen is affected in all forms of amyloidosis and appears diffuse and homogeneous in most patients. 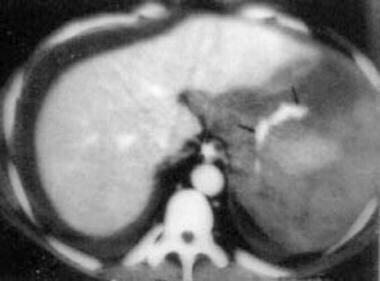 Diffuse decreased splenic attenuation with contrast enhancement can be seen on CT scans, but focal abnormalities, which can mimic laceration, are also possible. Spontaneous splenic rupture, believed to result from capsular weakening from amyloid deposition, has been reported. Decreased attenuation in other involved organs (eg, liver and kidneys) can aid in distinguishing amyloidosis from a traumatic etiology. In addition, amyloid deposition in the retroperitoneal fat and mesentery leads to increased attenuation on CT scans. Bartonella organisms are gram-negative bacilli originally considered to primarily infect patients with HIV infection. However, recent studies have demonstrated a Bartonella species to be the causative organism of catscratch disease. Therefore, the bacteria can infect immunocompetent individuals as well. Two primary infectious processes result from infection by Bartonella organisms; the form involving the liver and spleen is called bacillary peliosis hepatis. Pathologically, the bacilli cause capillary dilation, resulting in numerable thin-walled, blood-filled cavities throughout the liver and spleen. 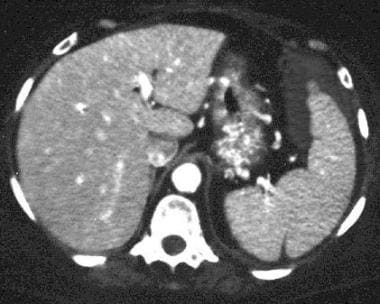 Abdominal CT shows multiple low-attenuating lesions in the liver and spleen with associated lymphadenopathy and possible ascites. Lesions can coalesce to form multiloculated or septated lesions demonstrating variable contrast enhancement. Spontaneous splenic rupture has been reported in patients with bacillary peliosis hepatis. A similar appearing process has been described related to the use of oral contraceptives, chemotherapeutic agents, and anabolic steroids, but the etiology of these processes remains obscure. Any of the processes mentioned above may predispose the spleen to rupture, resulting in trivial degrees of trauma. A spleen enlarged by tumor masses or anemia may be injured with a simple fall on the sidewalk. A peripherally situated hemangioma or cyst may rupture with apparently insignificant trauma because of a weakened overlying capsule. These conditions are associated with hemoperitoneum or parenchymal hemorrhage and are virtually indistinguishable from simple splenic trauma. The limitations of CT scanning are few but possibly important. The most detrimental limitation to confident interpretation of a CT scan is motion artifact. The sensitivity for the detection of a splenic injury decreases precipitously if the patient cannot remain still on the scanning table. Adequate sedation is essential in such patients. Overall, the sensitivity and specificity of CT in the detection of splenic injury is close to 100% in the authors' experience. Any deficiency in detection is usually a result of misinterpretation of the information and not an absence of findings. Failure of conservative treatment involves grade III, IV, or V injuries more often than grade I and II injuries. In many studies, splenic artery embolization (SAE) has been described by using many different approaches. One primary point of discussion concerns the differences between main SAE, selective or superselective SAE, and embolization in a combination of sites. To the authors' knowledge, no studies have been performed to compare outcomes or complication rates based on the various levels of SAE. Theoretically, the infarction rate is expected to increase as embolization becomes more selective. Conversely, therapeutic failure is expected to increase with more proximal SAE. This presumption is based on collateral blood flow differences inherent with the particular level of embolization. Sclafani et al  and Hagiwara et al  have described SAE techniques dependent on angiographic findings. The visualization of extrasplenic extravasation was treated with selective Gelfoam embolization or superselective gelatin sponge particle injection, respectively, followed by main SAE by means of coil occlusion. Main SAE alone was performed if intraparenchymal contrast-material extravasation was the only finding. Hagiwara et al  also selected an additional group of patients whose angiograms demonstrated vascular disruption without extravasation. This group also was treated by using main SAE alone. SAE was not performed if the angiogram showed only avascular areas or evidence of subcapsular hematoma without extravasation. The overall success rate in the 2 studies was greater than 90%. The treatment of posttraumatic arteriovenous fistulas and pseudoaneurysms appears to require a different approach. Arteriovenous fistulas probably remain patent after main SAE, and they have been reported by Hagiwara et al. Many investigators have reported the use of superselective coil embolization without main SAE to be successful in these patients. [12, 13, 14] Davis et al reported successful nonoperative treatment in 20 of 20 patients in whom pseudoaneurysms were embolized. All of the 6 patients in whom pseudoaneurysms could not be coiled for various reasons eventually required splenectomy. Data attest to the need for definitive treatment if a pseudoaneurysm is documented angiographically. Another interesting point elicited by Davis et al was the fact that 4 patients whose CT scans demonstrated contrast blush indicative of a pseudoaneurysm had negative findings on SA angiograms. All 4 patients were treated successfully without surgery. 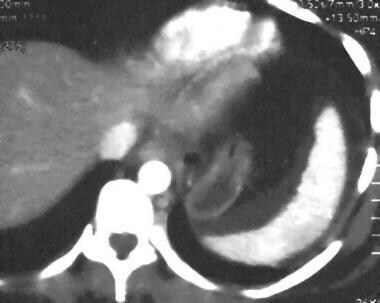 The pseudoaneurysms may have thrombosed spontaneously, or the CT findings may have related to small areas of contained extravasation that caused tamponade. In either situation, data support a scenario in which positive CT findings should lead to angiographic evaluation. Negative angiographic findings are highly correlated with a good outcome in patients undergoing conservative treatment. Positive angiographic findings necessitate some form of intervention, be it angiographic or surgical. The complication rate of SAE appears to be sufficiently low that it is not a significant concern compared with that of splenectomy. Data by Mozes et al showed a 2.4% (3 of 126) mortality within the first 6 months, compared with an 8% (2 of 25) mortality associated with splenectomy. Both deaths related to splenectomy were associated with postoperative pancreatitis. Of the 126 patients who underwent SAE, 3 (2.4%) developed pancreatitis after embolization, but they did not die. 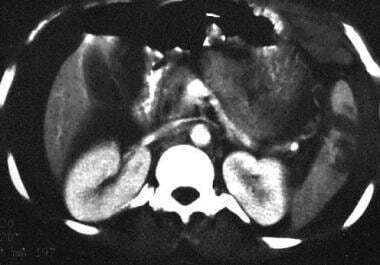 Pancreatitis likely was a result of embolization of important collateral pancreatic vessels from the SA. Splenic abscess formation occurred in 4 (3%) of 126 patients. The most common cause of morbidity after SAE was the formation of pleural effusion in 9.5% of patients (12 of 126). The morbidity of SAE is correlated with the percentage of splenic tissue embolized. Statistics reported by Mozes et al were based on the embolization of no more than 60-70% of splenic tissue. Others have confirmed the unacceptably high morbidity and mortality rates involved with excessive tissue embolization or attempted nonsurgical splenectomy. Morbidity rates as high as 79%  and mortality rates ranging from 12%  to 43%  have been reported in the literature. The angiographer must be aware of these reports. SAE should probably not be offered as an option if the procedure is likely to result in excessive splenic tissue loss, because splenectomy is associated with lower relative risk. A patient who has significant or total splenic volume infarction after SAE requires close observation for the development of complications. When the data are considered, continuing with splenectomy when the patient is stabilized may be prudent if complete splenic infarction occurs after SAE. In most circumstances, chest and abdominal radiography is the initial step in the evaluation of patients with blunt torso trauma (see the image below). However, the effects of blunt trauma are frequently masked by more obvious associated injuries. In most patients, the symptoms of blunt splenic trauma are absent or subtle; this characteristic probably explains the higher mortality associated with blunt abdominal trauma than with penetrating injury. Missed splenic rupture or delayed diagnosis is associated with a 10-fold increase in mortality over the rate associated with prompt recognition of injury. Therefore, the radiologist must have a high index of suspicion and a low threshold for suggesting further evaluation with cross-sectional imaging. Plain radiographic findings are numerous but occasionally subtle, and awareness of the imaging possibilities is important in effectively evaluating the information. Plain radiographs demonstrate a wide variety of abnormal findings. The constitution of findings reflects whether the spleen has sustained capsular rupture. Normal findings on chest and abdominal radiographs do not exclude splenic injury. The most common finding associated with splenic injury is left lower rib fracture. Rib fractures signify that adequate force has been transmitted to the LUQ to cause splenic pathology. Left lower rib fracture is present in 44% of patients with splenic rupture and necessitates further workup by abdominal CT. The classic triad indicative of acute splenic rupture (ie, left hemidiaphragm elevation, left lower lobe atelectasis, and pleural effusion) is not commonly present and should not be regarded as a reliable sign. However, any patient with apparent left hemidiaphragm elevation following blunt abdominal trauma should be considered to have splenic injury until proven otherwise. More reliable signs of LUQ injury are medial displacement of the gastric bubble and inferior displacement of the splenic flexure gas pattern. These findings are indicative of a left upper quadrant (LUQ) mass and result from either subcapsular or perisplenic hematoma. LUQ hematoma, if sufficiently large, can displace the shadow of the inferior splenic margin caudally, simulating splenomegaly. Subcapsular hematoma can produce a similar appearance, and the appreciated mass has distinct borders. Associated displacement of the left renal shadow also may be evident. The constitution of findings present when retroperitoneal hemorrhage or free intra-abdominal blood exists contrasts with those mentioned above. Little, if any, mass effect on LUQ organs is apparent. Splenic margins are obscured, but this finding is not specific. Retroperitoneal blood can obliterate the left renal outline and psoas muscle margin. Free blood pools exist dependently in the left paracolic gutter, displacing the descending colon gas pattern medially. Larger amounts of abdominal hemorrhage can obliterate the flank stripe. The small bowel gas pattern can be displaced out of the pelvis by collecting hemorrhage, and a midpelvic opacity with sharp convex lateral borders may result. The bladder margin is enhanced and demarcated by a thin lucency outlining the dome and representing extraperitoneal fat. Chronic splenic hematoma appears different and is more problematic because it is accompanied by a long list of differential diagnoses. The usual course of a subcapsular or parenchymal hematoma is to contract; liquefy; and, usually, resorb. Occasionally, cystic degeneration of an intrasplenic hematoma results in formation of a false cyst. Approximately 80% of splenic cysts are estimated to be posttraumatic in origin. Approximately 80% of these are termed hemorrhagic cysts, and the other 20% are termed serous cysts and probably represent hemorrhagic cysts in which the blood has been resorbed totally. Thin, regular, annular calcification develops in the fibrous lining of approximately 30% of cysts. Cysts are symmetric and unilocular, and their calcified lining has a smooth inner and outer margin. A single, large, annular, splenic calcification most likely represents a residual traumatic cyst in areas not endemic for Echinococcus organisms. The imaging characteristics of traumatic cysts are not distinctive. The most common cause of calcified splenic cysts worldwide is infection by Echinococcus granulosus, but the organism is rare outside its normal geographic distribution. E granulosus affects the liver more commonly than other organs, with a minority of patients having concurrent splenic disease. Isolated splenic involvement is uncommon. When it occurs, multiple lesions are present; however, calcification almost always is restricted to a single cyst. Cysts tend to have a smooth outer wall, but calcification can be irregular. Often, part of the wall appears flattened or indented, and intracystic opacities are common. Collapse of the hydatid cyst can occur with infolding of the walls. Splitting of the wall calcification represents separation of the endocyst and pericyst linings. A single cyst in an enlarged left lobe of the liver may simulate splenic pathology. Careful observation reveals mass effect directed laterally, in contrast to the medial displacement appreciated with a splenic mass. An epidermoid cyst of the spleen is a congenital abnormality that results from infolding or entrapment of peritoneal mesothelium within the spleen. Cysts are slow growing and usually appear in those aged 10-30 years. Cysts are unilocular and solitary 80% of the time, with an average size of 10 cm. Curvilinear wall calcification occurs in 9-25% of cysts, and appearance is identical to a traumatic splenic cyst. Calcified cysts of surrounding organs in the LUQ can simulate chronic splenic injury. Simple renal cysts have a peak incidence in patients older than 30 years. Renal cysts are present in 3-5% of all individuals at autopsy and account for 62% of all renal masses. Although only 1% of renal cysts show marginal calcification, a calcified renal cyst is not an uncommon finding, considering the large number that exist. Adrenal cysts usually are solitary, and 50% are larger than 5 cm. They most commonly appear in those aged 20-60 years, with a slight female predominance. Rimlike nodular calcification is present in 51-69% of adrenal cysts. Pancreatic pseudocysts and mesenteric cysts are possible but rarely calcify. Splenic artery (SA) aneurysm is the number one visceral aneurysm. The etiology can be atherosclerotic disease, pancreatitis, or previous trauma. The incidence in females is higher than that in males, and it is highest in women of childbearing age who have had 2 or more pregnancies. Although usually asymptomatic, LUQ pain or fullness is a complaint in 50% of patients. As many as 66% of aneurysms develop calcification, which is annular but characteristically thicker and more irregular than that seen in splenic cysts. Associated SA calcification may be present if atherosclerotic disease is the cause. Plain radiographs can show a diagnostic interruption in the calcification where the aneurysm originates in the SA. Complex multiloculated configurations also are possible and are distinct from traumatic splenic cysts. Subcapsular hematoma is a common result of splenic trauma and demonstrates imaging characteristics different from those of parenchymal pathology. As the hematoma resolves, fine marginal calcification of the cavity can develop. 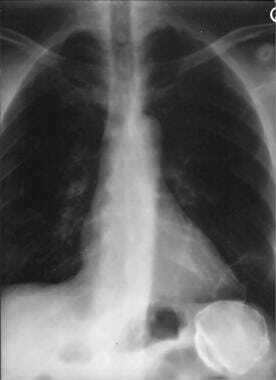 Depending on the projection, the calcified cavity can appear linear or discoid. The degree of mass effect depends on the size of the regressing hematoma. Many pathologic entities can have similar findings, most notably sickle cell disease. A chronic splenic infarct may develop calcification similar to that of subcapsular hematoma. A large hematoma viewed en face can be misinterpreted as a contracted hyperopaque spleen of sickle cell disease. In sickle cell disease or thalassemia, the spleen remains enlarged despite calcification or increased density, confusing the differential. In fact, any process leading to splenic infarction or fibrosis can cause calcification and simulate chronic subcapsular hematoma. At most institutions, CT is the modality of choice for evaluation of blunt abdominal trauma. [20, 21, 22, 23] Overall, sensitivity and specificity are high for detection of splenic trauma. Intravenous contrast material is necessary for complete evaluation because areas of hematoma are frequently isoattenuating relative to the parenchyma on nonenhanced images. CT images of splenic trauma are provided below. Spleen, trauma. 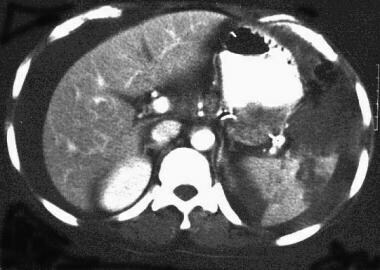 Contrast-enhanced CT scan of the abdomen shows congenital splenic clefts with perisplenic fluid secondary to metastatic ovarian carcinoma. This mimics a splenic injury. The spleen demonstrates a multitude of normal variations in shape. Lobulations are common, and clefts between lobulations can be as deep as 2-3 cm. Clefts can mimic lacerations but should appear more smoothly contoured and sharply marginated than lacerations. Accessory splenic tissue occurs in 10-30% of individuals and develops in multiple sites in approximately 10%. The most common location is in the hilar region, followed by the suspensory ligaments, particularly the gastrosplenic ligament. Accessory tissue can mimic fragmentation, but margins are smooth and better defined than they are in lacerations. Blunt splenic trauma can result in subcapsular hematoma, intraparenchymal hematoma, laceration, or fragmentation with autosplenectomy. Laceration appears as an irregular hypodense area of nonenhancement, with somewhat indistinct borders compared to the margin in an unlacerated spleen. Subcapsular hematomas are regularly shaped, crescentic, hypoattenuating collections closely applied to the perceived splenic margin. The margins are usually sharp in distinction to a perisplenic clot. Underlying deformity or indentation of the parenchyma is appreciated. Intraparenchymal hematoma is a broader, more irregular, hypoattenuating area with mass effect and enlargement of the spleen. A parenchymal hematoma, which is contained within the spleen, should have a discernible rim of surrounding splenic tissue on contrast-enhanced images. On nonenhanced images, the hematoma can appear hypoattenuating, isoattenuating, or hyperattenuating compared with the parenchyma. Spleen, trauma. 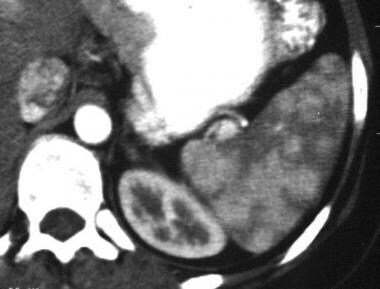 Contrast-enhanced CT scan of the abdomen shows a complex lower pole splenic laceration. This is a grade II injury. Spleen, trauma. Contrast-enhanced CT scan of the abdomen shows a massive fluid collection in the upper abdomen. This was a chronic subcapsular splenic hematoma and a grade III injury. Grade IV injuries include laceration involving segmental or hilar vessels, with devascularization of more than 25% of the spleen (see the images below). Spleen, trauma. Contrast-enhanced CT scan of the abdomen shows a small hilar laceration. This is a grade III-IV injury. Spleen, trauma. Contrast-enhanced CT scan of the abdomen shows a complex laceration extending to the hilum. This is a grade IV injury. Grade V injuries include a shattered spleen or hilar vascular injury (see the image below). Hemoperitoneum almost always accompanies splenic injury. Uncommonly, a perisplenic clot is present without evidence for capsular disruption, which has been reported in approximately 9% of patients and is termed the sentinel clot. The sentinel clot is a sensitive sign of visceral injury and should prompt careful inspection of the images for an etiology; however, a small laceration can be compressed by perisplenic clot, rendering it invisible. The CT appearance of intraperitoneal blood depends on the age and physical state of the clot. Immediately after hemorrhage, intraperitoneal blood has the same attenuation as circulating blood of 20-30 HU. However, attenuation values less than 20 HU are a frequent finding in the acute setting. The proposed reason for this is that blood, being a strong peritoneal irritant, causes a local inflammatory response with transudation of fluid across the peritoneum. After a few weeks, most hematomas have attenuation values approaching those of water, namely, 0-20 HU. The scenario just described is a simplified version based on a single episode of hemorrhage. In reality, hemoperitoneum can have a complex appearance as a result of recurrent hemorrhage and irregular resorption. Blood may exist in many different stages at the time of imaging if hemorrhage has been intermittent. Fresh blood that is confined to a localized space or that has been relatively undisturbed may separate, with plasma layered on top of precipitated red blood cells causing the hematocrit effect. Hemoperitoneum does not indicate whether active hemorrhage is present. Repeat imaging, as clinically warranted, can aid in detecting ongoing hemorrhage. Increasing hematoma size or changes in character contrary to the expected sequence are indications of continued hemorrhage. In most instances, hemoperitoneum significantly resolves within 1 week. In one study, intra-abdominal hematoma with a stable appearance 3-7 days after injury was suggestive of continued hemorrhage. Depending on the physical state of the existing hematoma, fresh blood appears either relatively hypoattenuating or hyperattenuating. In adult patients with a total CT score of less than 2.5, nonsurgical treatment was successful in all patients. A score of 2.5 or more is correlated with a 46% likelihood of successful nonsurgical treatment. In one study, all pediatric patients younger than 17 years had successful conservative treatment without delayed complications irrespective of the score. A subsequent study elucidated potential errors of the scoring system, particularly in discriminating subcapsular from perisplenic fluid and accounting for interobserver variability. However, 13 of 15 patients treated nonsurgically who had a score of less than 2.5 had favorable outcomes. Despite the criticisms, overall conservative treatment failed in only 2 (10%) of 21 patients. This result represents a significant improvement over the 22-75% failure rates reported in the literature. Conversely, 8 unnecessary laparotomies would have been performed if the grading system had been used. This would have been an 89% increase. Obviously, the scoring system created by Resciniti is imperfect, and further evaluation is needed  . In the authors' experience, the overall sensitivity and specificity of CT in the detection of splenic injury is close to 100%. One pitfall of the use of contrast material is that bolus injection with early imaging can produce heterogeneous splenic enhancement, because red and white pulps demonstrate differing blood flow rates. The characteristic tiger-stripe pattern results. The pattern should not be confused with traumatic change and can be remedied by delayed imaging or slower injection rates. Acute blood is hypoechoic and can be almost anechoic. Differentiating subcapsular from perisplenic blood is difficult, but a few clues are available. For example, a smooth crescentic collection conforming to the splenic margin probably should be considered subcapsular, whereas extracapsular blood is usually shaped more irregularly. Although mass effect is produced in both cases, subcapsular blood is more likely to distort splenic shape. In addition, the membrane overlying subcapsular collections is thin and uncommonly depicted; therefore, the absence of this finding does not suggest either diagnosis. Within hours, coagulation of hemorrhage occurs. Echogenicity increases as the thrombus condenses. Mature hematomas demonstrate echogenicity equal to or slightly greater than parenchyma and retain this appearance for approximately 48 hours until lysis begins. The echogenic phase usually corresponds to the time when imaging is performed in most acute circumstances. As lysis proceeds, the hematoma returns to fluid echogenicity, and the pathology is again more apparent. Parenchymal abnormalities commonly are subtle. Lacerations appear as hypoechoic regions, which can be irregular or linear in configuration. A splenic infarct has a similar appearance, but it is usually better defined. Infarcts are wedge shaped, with the apex toward the hilum, compared to traumatic injury in which a more complex distribution is seen. Subtlety of parenchymal injury probably relates to associated local hemorrhage. Any trapped blood soon coagulates, becoming isoechoic with the surrounding tissue. A study aimed at correlating the presence of abdominal fluid with visceral injury seen on sonograms revealed fluid in the RUQ in 71% of the 69 patients confirmed to have isolated blunt splenic injury; fluid in the LUQ in 33%; and fluid in the pelvis in 30%. Although individual patient data were not supplied, a significant number of patients had fluid in the RUQ without any appreciated in the LUQ. Obviously, blood must have been present in the LUQ at some point after the initial injury. Although the authors concluded that ultrasonography was sensitive for detection of blunt visceral injury overall, the study revealed its insensitivity in recognizing splenic injury. Surely, something is amiss if the LUQ was interpreted as being fluid-free in 69 patients with documented blunt splenic trauma. A number of possible reasons may explain the discrepancy. First, blood in the LUQ is, on average, older than blood elsewhere in the abdomen. Hemorrhage initially pools in the perisplenic area and spills over into the remainder of the abdomen as a larger amount accumulates. With lower grades of injury or slower bleeding rates, the blood coagulates and fills the potential space. On subsequent episodes of hemorrhage, fresh blood may be displaced from the LUQ secondary to mass effect from the thrombus. Ultrasonography of the LUQ does not show any free fluid. Conversely, the hemorrhage may be subdiaphragmatic and difficult to image. The spleen is displaced inferiorly, and no fluid is appreciated in the splenorenal space. Second, the echogenicity of an acute clot is equal to or greater than that of the splenic parenchyma. A clot may be inseparable from the adjacent spleen. The injury is misdiagnosed as splenomegaly or not appreciated at all. The clot also may be mistaken for overlying bowel or artifact from a poor acoustic window. The use of nuclear radiology to assess trauma has decreased significantly over the past several decades. The advent of dedicated trauma centers and new treatment protocols, as well as improved imaging technology, are the reasons for this waning use in the acute setting. The use of nuclear imaging is relegated to evaluation of chronic injury or injuries with delayed presentation. The role of nuclear imaging with respect to splenic trauma is limited to distinguishing findings in the differential diagnosis when the presentation or clinical history does not equivocally indicate trauma. The importance of obtaining multiple views cannot be stressed enough. Imaging must include both anterior and posterior projections, with multiple oblique images because small defects may be discernible on only 1 image or a few images. Splenic trauma may appear as simple displacement, reduced size, focal defects, a band of decreased activity, or loss of splenic contours. Currently, the trend is toward splenic salvage, as opposed to splenectomy, whenever possible. In a patient who has undergone splenorrhaphy or has received conservative treatment, physical activity is limited significantly for 8-12 weeks. Some institutions image the spleen prior to releasing the restrictions to document adequate fracture healing. The liver-spleen scan is a viable alternative to CT for follow-up studies of splenic injury. Intravenous contrast material is not required and the whole-body radiation dose of 0.0002 Gy/mCi (range, 3-5 mCi) is less than that of conventional CT. Scans demonstrate resolution of the defect in uptake, although a small area of decreased activity may persist secondary to scar formation. In splenic imaging, technetium-99m sulfur colloid scanning remains the test of choice. Acute splenic injury can be diagnosed with a high degree of sensitivity, but the specificity is less than desirable. Small subcapsular hematomas or contusions may be missed. Splenic abscesses, infarcts, cysts, and benign or malignant masses present with the same findings and are indistinguishable from trauma. False-positive findings may result from variations in the normal shape of the spleen. A thorough knowledge of the splenic artery (SA) is needed to analyze traumatic damage correctly and offer therapeutic options. Splenic trauma can produce a wide variety of angiographic findings, either directly or indirectly (see the images below). Spleen, trauma. 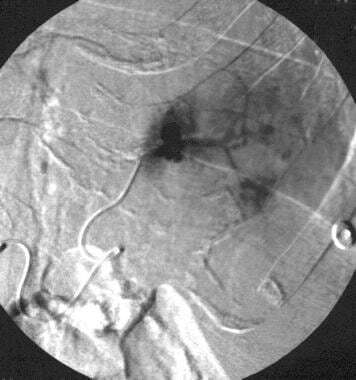 Arteriogram obtained with a main splenic artery catheter injection shows multiple areas of parenchymal contrast agent extravasation. Spleen, trauma. 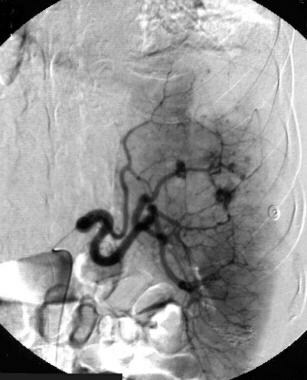 Selective splenic arteriogram shows traumatic pseudoaneurysms with extravasation in the upper pole. Spleen, trauma. 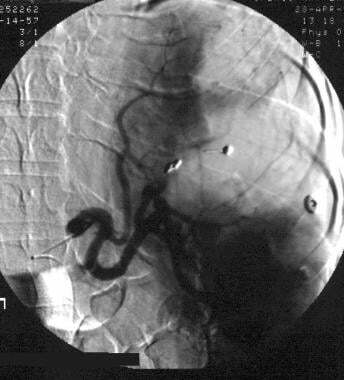 Arteriogram obtained with a main splenic artery injection after superselective coil embolization of pseudoaneurysms. Irregular contrast opacification is still present within an avascular area; it possibly represents another area of vascular injury. Spleen, trauma. 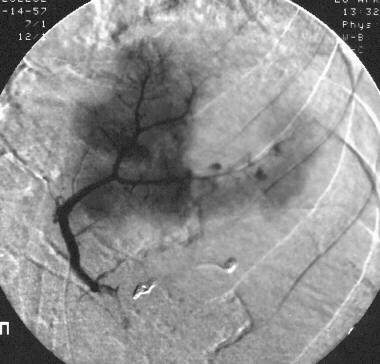 Arteriogram obtained with a superselective splenic artery injection in the upper pole confirms a second zone of vascular disruption with contrast agent extravasation. Spleen, trauma. Angiogram obtained after superselective coil embolization of the upper pole artery shows adequate treatment without extravasation. Spleen, trauma. Final arteriographic image from a main splenic artery catheter injection after selective/superselective coil embolization. Approximately 50% of the spleen has been devascularized. No residual arterial vascular injury or extravasation is present. The patient recovered uneventfully. Indirect signs include displacement of the spleen from the abdominal wall and avascular parenchymal areas from hematoma. Peripheral parenchymal defects may represent subcapsular hematomas, but care must be taken not to confuse traumatic change with developmental notching or lobulation. Mass effect can be identified with traumatic injury. Compression of the vascular pattern along the defect margin is characteristic of subcapsular hematoma. Defects from chronic change, such as infarct, should have clear margins that are more regular in contour without mass effect. Parenchymal hematoma usually demonstrates hazy borders with splaying of the surrounding vessels. Hematoma age affects the degree to which these characteristics are visualized. Parenchymal irregularity or mottling may result from localized edema of a contusion without apparent vessel abnormalities. The most reliable angiographic sign of splenic trauma is contrast-material extravasation, either parenchymal or extrasplenic. At times, extravasation may be observed only after the administration of vasopressin or epinephrine. These medications enhance detection of vascular injury by increasing precapillary arteriolar resistance. Abrupt cutoff of vessels, vessel wall irregularity, pseudoaneurysms, and early filling of splenic veins are findings of traumatic injury. Classically, rupture of a subcapsular hematoma had been implicated as the cause of delayed bleeding; however, it has been found that subcapsular hematoma may not be a predictor of delayed splenic rupture and that lysis of hematoma at the injury site may be the most likely cause. Angiographic criteria have been proposed in an attempt to determine which injuries pose the greatest risk of delayed hemorrhage. Many authors have proposed grading systems of splenic injury, but these systems are somewhat confusing and complicated. Splenic fragmentation or major arterial injury signifies impending life-threatening complications in most patients, and they require immediate surgical intervention. The absence of contrast-material extravasation from the parenchymal vessels was correlated with successful conservative treatment in one study. Active extravasation, even intraparenchymal extravasation, can cause tamponade and cease spontaneously, but it is correlated with delayed capsular rupture. Large avascular areas, defined as those involving more than 25% of the spleen, is correlated with a poor outcome. An avascular area of less than 25% is associated with a good outcome. These differences are probably related to more than one factor. A large avascular area requires injury to either a more central, larger vessel or multiple regional peripheral vessels, as opposed to a smaller avascular area. A central vessel has greater blood flow and higher systolic pressure, both of which increase the likelihood of rupture as the hematoma matures and undergoes lysis. When small vessel disruption is suspected, an increased risk of delayed hemorrhage between the large and small avascular areas may be related to statistical chance when a large number of vascular branches are injured. Raikhlin A, Baerlocher MO, Asch MR, Myers A. Imaging and transcatheter arterial embolization for traumatic splenic injuries: review of the literature. Can J Surg. 2008 Dec. 51(6):464-72. [Medline]. Ransom KJ, Kavic MS. Laparoscopic splenectomy for blunt trauma: a safe operation following embolization. Surg Endosc. 2008 May 7. [Medline]. Visrutaratna P, Na-Chiangmai W. Computed tomography of blunt abdominal trauma in children. Singapore Med J. 2008 Apr. 49(4):352-8; quiz 359. [Medline]. Fakhre GP, Berland T, Lube MW. One hundred consecutive splenectomies for trauma: is histologic evaluation really necessary?. J Trauma. 2008 Apr. 64(4):1139-41. [Medline]. Huebner S, Reed MH. Analysis of the value of imaging as part of the follow-up of splenic injury in children. Pediatr Radiol. 2001 Dec. 31(12):852-5. [Medline]. Kimbrell OC Jr. Sarcoidosis of the spleen. N Engl J Med. 1957. 257:128-31. Hurd WW, Katholi RE. Acquired functional asplenia. Association with spontaneous rupture of the spleen and fatal spontaneous rupture of the liver in amyloidosis. Arch Intern Med. 1980 Jun. 140(6):844-5. [Medline]. Tsuda K, Nakamura H, Murakami T, et al. Peliosis of the spleen with intraperitoneal hemorrhage. Abdom Imaging. 1993. 18(3):283-5. [Medline]. Davis KA, Fabian TC, Croce MA, et al. Improved success in nonoperative management of blunt splenic injuries: embolization of splenic artery pseudoaneurysms. J Trauma. 1998 Jun. 44(6):1008-13; discussion 1013-5. [Medline]. Patel NY, Cogbill TH, Gundersen LH. Angioembolization of multiple intrasplenic pseudoaneurysms as a result of blunt trauma. J Vasc Surg. 1996 Aug. 24(2):299-301. [Medline]. Salis A, Pais SO, Vennos A, Scalea T. Superselective embolization of a traumatic intrasplenic arteriovenous fistula. J Trauma. 1999 Jan. 46(1):186-8. [Medline]. Mozes MF, Spigos DG, Pollak R, et al. Partial splenic embolization, an alternative to splenectomy--results of a prospective, randomized study. Surgery. 1984 Oct. 96(4):694-702. [Medline]. Castaneda-Zuniga WR, Hammerschmidt DE, Sanchez R, Amplatz K. Nonsurgical splenectomy. AJR Am J Roentgenol. 1977 Nov. 129(5):805-11. [Medline]. Alwmark A, Bengmark S, Gullstrand P, et al. Evaluation of splenic embolization in patients with portal hypertension and hypersplenism. Ann Surg. 1982 Nov. 196(5):518-24. [Medline]. Dachman AH, Ros PR, Murari PJ, et al. Nonparasitic splenic cysts: a report of 52 cases with radiologic-pathologic correlation. AJR Am J Roentgenol. 1986 Sep. 147(3):537-42. [Medline]. Franquet T, Montes M, Lecumberri FJ, et al. 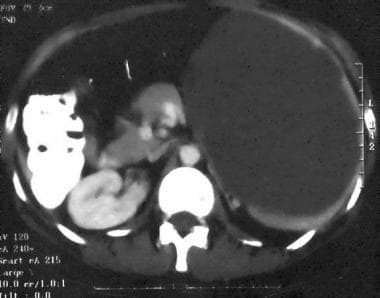 Hydatid disease of the spleen: imaging findings in nine patients. AJR Am J Roentgenol. 1990 Mar. 154(3):525-8. [Medline]. Killeen KL, Shanmuganathan K, Boyd-Kranis R, et al. 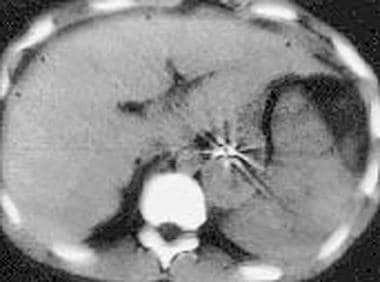 CT findings after embolization for blunt splenic trauma. J Vasc Interv Radiol. 2001 Feb. 12(2):209-14. [Medline]. Gordic S, Alkadhi H, Simmen HP, Wanner G, Cadosch D. Characterization of indeterminate spleen lesions in primary CT after blunt abdominal trauma: potential role of MR imaging. Emerg Radiol. 2014 Oct. 21 (5):491-8. [Medline]. Naulet P, Wassel J, Gervaise A, Blum A. Evaluation of the value of abdominopelvic acquisition without contrast injection when performing a whole body CT scan in a patient who may have multiple trauma. Diagn Interv Imaging. 2013 Apr. 94(4):410-7. [Medline]. Boscak AR, Shanmuganathan K, Mirvis SE, Fleiter TR, Miller LA, Sliker CW, et al. Optimizing trauma multidetector CT protocol for blunt splenic injury: need for arterial and portal venous phase scans. Radiology. 2013 Jul. 268(1):79-88. [Medline]. Buntain WL, Gould HR, Maull KI. Predictability of splenic salvage by computed tomography. J Trauma. 1988 Jan. 28(1):24-34. [Medline]. Trauma scoring. Trauma.org. Available at http://www.trauma.org/archive/scores/ois.html. Accessed: October 2, 2007. Orwig D, Federle MP. Localized clotted blood as evidence of visceral trauma on CT: the sentinel clot sign. AJR Am J Roentgenol. 1989 Oct. 153(4):747-9. [Medline]. Levine CD, Patel UJ, Silverman PM, Wachsberg RH. Low attenuation of acute traumatic hemoperitoneum on CT scans. AJR Am J Roentgenol. 1996 May. 166(5):1089-93. [Medline]. Federle MP, Jeffrey RB Jr. Hemoperitoneum studied by computed tomography. Radiology. 1983 Jul. 148(1):187-92. [Medline]. Schurr MJ, Fabian TC, Gavant M, et al. Management of blunt splenic trauma: computed tomographic contrast blush predicts failure of nonoperative management. J Trauma. 1995 Sep. 39(3):507-12; discussion 512-3. [Medline]. Resciniti A, Fink MP, Raptopoulos V, et al. Nonoperative treatment of adult splenic trauma: development of a computed tomographic scoring system that detects appropriate candidates for expectant management. J Trauma. 1988 Jun. 28(6):828-31. [Medline]. Umlas SL, Cronan JJ. Splenic trauma: can CT grading systems enable prediction of successful nonsurgical treatment?. Radiology. 1991 Feb. 178(2):481-7. [Medline]. Elmore JR, Clark DE, Isler RJ, Horner WR. Selective nonoperative management of blunt splenic trauma in adults. Arch Surg. 1989 May. 124(5):581-5; discussion 586. [Medline]. Godley CD, Warren RL, Sheridan RL, McCabe CJ. Nonoperative management of blunt splenic injury in adults: age over 55 years as a powerful indicator for failure. J Am Coll Surg. 1996 Aug. 183(2):133-9. [Medline]. Longo WE, Baker CC, McMillen MA, et al. Nonoperative management of adult blunt splenic trauma. Criteria for successful outcome. Ann Surg. 1989 Nov. 210(5):626-9. [Medline]. Smith JS Jr, Wengrovitz MA, DeLong BS. Prospective validation of criteria, including age, for safe, nonsurgical management of the ruptured spleen. J Trauma. 1992 Sep. 33(3):363-8; discussion 368-9. [Medline]. Smith JS Jr, Cooney RN, Mucha P Jr. Nonoperative management of the ruptured spleen: a revalidation of criteria. Surgery. 1996 Oct. 120(4):745-50; discussion 750-1. [Medline]. Goodman LR, Aprahamian C. Changes in splenic size after abdominal trauma. Radiology. 1990 Sep. 176(3):629-32. [Medline]. Doody O, Lyburn D, Geoghegan T, Govender P, Monk PM, Torreggiani WC. Blunt trauma to the spleen: ultrasonographic findings. Clin Radiol. 2005 Sep. 60(9):968-76. [Medline]. Boulanger BR, McLellan BA, Brenneman FD, et al. Emergent abdominal sonography as a screening test in a new diagnostic algorithm for blunt trauma. J Trauma. 1996 Jun. 40(6):867-74. [Medline]. Goldberg BB, Goodman GA, Clearfield HR. Evaluation of ascites by ultrasound. Radiology. 1970 Jul. 96(1):15-22. [Medline]. Cagini L, Gravante S, Malaspina CM, Cesarano E, Giganti M, Rebonato A, et al. Contrast enhanced ultrasound (CEUS) in blunt abdominal trauma. Crit Ultrasound J. 2013 Jul 15. 5 Suppl 1:S9. [Medline]. [Full Text]. Rozycki GS, Ochsner MG, Feliciano DV, et al. Early detection of hemoperitoneum by ultrasound examination of the right upper quadrant: a multicenter study. J Trauma. 1998 Nov. 45(5):878-83. [Medline]. Yoshii H, Sato M, Yamamoto S, et al. Usefulness and limitations of ultrasonography in the initial evaluation of blunt abdominal trauma. J Trauma. 1998 Jul. 45(1):45-50; discussion 50-1. [Medline]. Cogbill TH, Moore EE, Jurkovich GJ, et al. Nonoperative management of blunt splenic trauma: a multicenter experience. J Trauma. 1989 Oct. 29(10):1312-7. [Medline].